Why does the Remington S7901 Wet 2 Straight Straightening Iron Work So Well When it comes to Straightening Curly Hair? Do you usually not straighten your hair in the morning because you always find yourself short of time? You certainly are not alone in this dilemma. Well, we have found what we think may be a solution to this problem. It’s called the Remington S7901 Wet 2 Straight Straightening Iron. It will save you time when you do your hair each day because it will both dry and straighten your hair at the same time. Very few flat irons can make that claim. Follow along as we do an in-depth review of this flat iron that we think will do a fast and efficient job of straightening your curly hair. 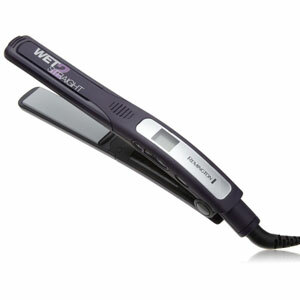 Of course, the main feature of this flat iron is its ability to be used on wet or dry hair. But it also has such other nice features as 30 different heat settings to choose from (300°F – 400°F). Its 1” wide styling plates offer a lot of versatility to those who use this flat iron also. This flat iron has very advanced plate technology also. It combines the benefits of ceramic coating with tourmaline crystal infusion. The result is a flat iron model that heats up fast, heats evenly, adds shine to your curly hair and also helps keep it from losing its all-important moisture. This is a lightweight and easy to use curling iron. It won’t stress your arm muscles while using it because it only weighs a little over 1-pound. The Remington S7901 Wet 2 Straight Straightening Iron also makes heat selecting easy thanks to its all-digital controls and display. 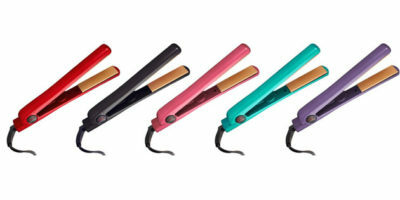 It has a tapered edge barrel design that does not allow your curly hair to catch on it as you are straightening it too. Also supplied with it is a nearly 7-foot power cord with attached swivel end. 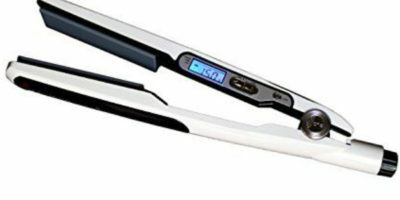 This flat iron will even automatically shut itself off after one hour of inactivity. There are a few reasons why this flat iron from Remington works so well at straightening curly hair. One of them is its specially designed vents that allow you to straighten your hair while wet. These vents allow your hair to stay moist during the straightening process but also allow the damaging high heat that steam can become to safely escape without doing harm to your hair. The ceramic/tourmaline plate technology it has is a big bonus when it comes to straightening your curly hair too. This technology provides very even plate heating so all the strands of hair that pass through it receive the vital heat they need to become pliable and straighten out. This technology will also help prevent frizz and leave your curly hair much shinier when the straightening process is finished. The warranty on this flat iron from Remington is nothing special but seems to conform to what can be considered the industry standard. Remington warranties this straightening iron for 2-years from the date of purchase. One of the concerns we had with this flat iron is the fact that its high heat setting is only 400°F. 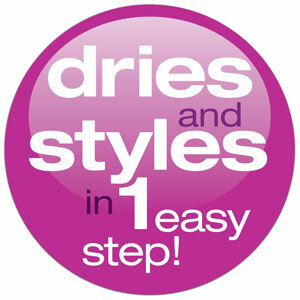 We feel that is maybe not high enough to reshape and straighten some thicker or coarser types of curly hair. Although it must be said if you are using it wet the moisture from its steam will help compensate for this. We also feel that the power cord is a little short at just under 7-feet long. We all really liked this model flat iron from Remington. It’s a unique as far as straightening irons are concerned because it can be used when your hair is wet without damaging it. The nice features of it don’t stop there either. It has a large assortment of heat choices and advanced ceramic/tourmaline heat plate technology. The 1” wide heat plates and its nicely contoured edges also make this a great curling and wave adding hair tool. There is a lot to like about this flat iron that certainly warrants consideration for purchase if you are shopping for one to use on your curly hair.